Our TEAM has prepared guidelines that outline a methodology for implementation of a self assessment methodology from Tanker Operators whose vessels participate in STS (Ship to Ship) Transfer operations. Although there is no explicit STS assessment within the TMSA procedures of OCIMF, STS Operations are now governed by statutory requirements under the new MARPOL Chapter 8 of ANNEX I. Resolution MEPC 186(59) and the Manual on oil Pollution, section I, prevention indicate procedures that have to be followed by Tanker Operators who are involved in STS operations. The quality of services offered by ships, crews and their managers depend a great deal on the level and competency of exercised due diligence prior, during and after each STS Operation. Preservation of high safety standards by Tanker Operators supports their reputation as well as the reputation of cargo owners and their charterers. 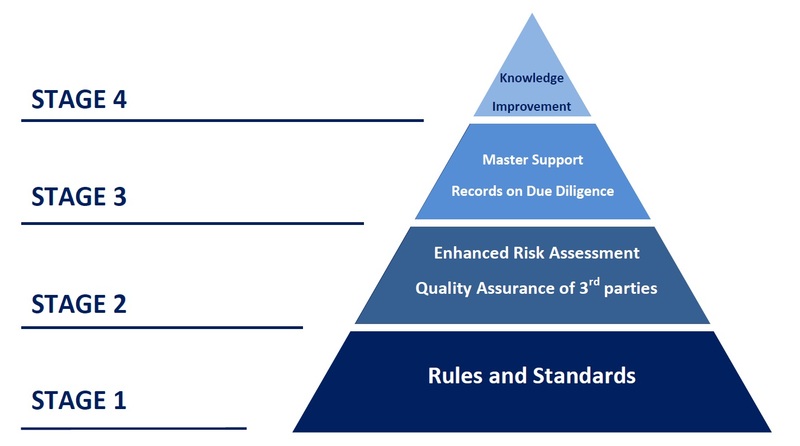 Section I of these guidelines includes a proposed self-assessment process that is supported by selected KPI’s. Tanker Operators may develop their procedures as proposed in the six steps as outlined in section II of the guidelines. Adopted Procedures should support the necessary actions for the four phases, PLAN, ACT, MEASURE and IMPROVE. The Self-assessment for STS Operations is being implemented through policies and procedures in 4 stages as shown on below figure. Procedures are prioritized on the basis of the importance in controlling the risk exposure as well as exercising due diligence in order to establish the STS knowledge gained from the entire fleet as an “asset” within the organization. This is the final target as shown on stage 4. The concept proposed for Ship to Ship transfer Operations is outlined in the following slides. Due diligence practices and assessment of STS records eventually enrich the STS knowledge of the organization through policies and procedures. The Screening and Risk Assessment service as well as OSIS support Tanker operators Policies in order to effectively develop the STS knowledge into an “asset” of the organization, with almost zero work load from shore personnel.